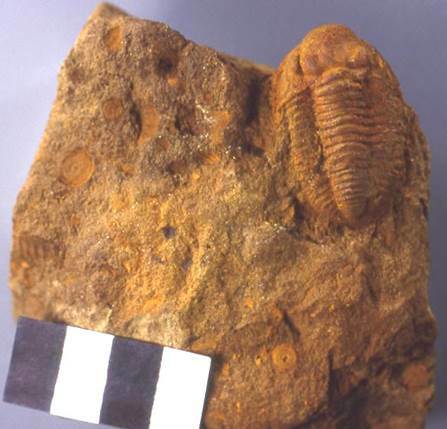 Well preserved specimens of the proetide trilobite Pudoproetus auriculatus (also known as Pudoproetus missouriensis) are rare. The specimen shown below is an internal mold of a complete exoskeleton in fossiliferous quartzose sandstone. These fossils have an orangish-brown coating of limonite (FeO·OH·nH2O - hydrous iron hydroxy-oxide). 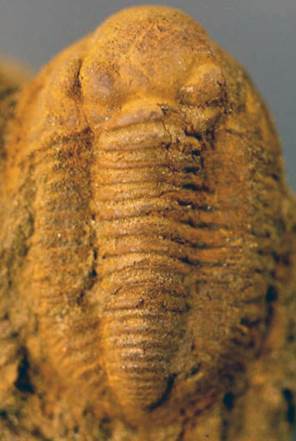 The trilobite is closely associated with isolated crinoid stem columnals. Stratigraphy: Byer Sandstone Member, lower Logan Formation, lower Osagean Stage, upper Lower Mississippian. Locality: roadcut on western side of Rt. 16, ~1.45 miles south of Granville, central Licking County, central Ohio, USA. Pudoproetus auriculatus (above & below) from the Byer Sandstone (Lower Mississippian) of Granville, Ohio, USA. Centimeter scale. Specimen collected 1961 by William D. Nichols. Housed at the Orton Geology Museum (Ohio State University, Columbus, Ohio, USA).